Made from hard drawn Aluminum. Lightweight. For mount resonant lines, elements for beams, etc. Insulated Aluminum clamps are available to order. 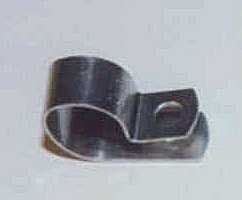 Steel cable clamps are available to order. combustion. It's non-abrasive smooth finish & rounded edges deter harm to item being held, eg. shorts. 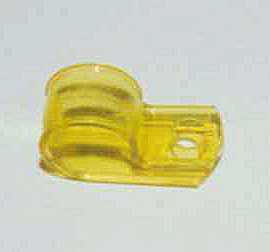 Use as a clamp, clip, hanger, strain relief, strap, fastener. 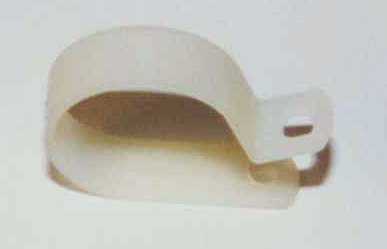 PTFE and Black Nylon (for UV protection) cable clamps are available to order. for general use as an indoor or outdoor cable clamp, strain relief, clip, hanger, strap, fastening device. It's non-abrasive smooth finish & rounded edges deter harm to item being held, eg. shorts.